This product contains a poster and story for each of the 5 digraph brothers. Students can refer to the posters and use Chuckie, Whitey, Theo, Phil, and Shane, to help them remember what each digraph says! !If you enjoy this product please be sure to check out The R Sisters Posters! This product contains a poster and story for each of the 7 r blend sisters. 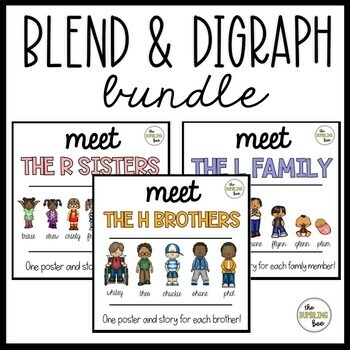 Students can refer to the posters/story and use Britt, Drew, Prim, Grace, Fran, Drew, and Trixie to help them remember what each blend says!If you like this product be sure to check out The H Brothers Posters! This bundled product contains posters for The H Brothers and R Sisters! The H Brothers contains a poster and story for each of the 5 digraph brothers. Students can refer to the posters and use Chuckie, Whitey, Theo, Phil, and Shane, to help them remember what each digraph says! The R Sisters also have a poster and story for each of the 7 r blend sisters. Students can refer to the posters/story and use Britt, Drew, Prim, Grace, Fran, Drew, and Trixie to help them remember what each blend says!